Results are posted online and our specialists help interpret test results and provide additional recommendations and advice. 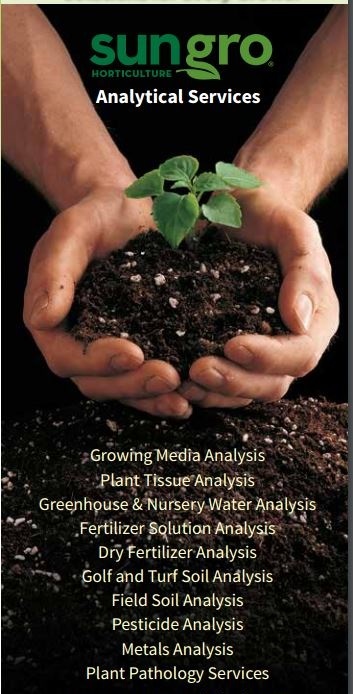 Regular media, irrigation water, soil, and plant tissue testing is insurance against crop production disasters. The detection and prevention of plant nutritional problems can be crucial to success. As nutritional problems advance, plant damage can become irreversible and crops unsellable or of lesser quality. Plant Pest and Pathology Services: Growers experiencing unknown pest and disease problems can get help using our pest and pathology services. We analyze infected or impacted tissue and showing signs and symptoms of a pest/disease problem, identify the pest/pathogen, and find solutions for your growing operation. We also offer pesticide testing services. Soil Analysis: Ground soil analysis creates of a “snapshot” of soil quality and nutritional conditions at sampling time. We commonly test field, turf, and golf green soils. Soil quality can vary from one field to the next. Areas that differ in soil type, appearance, crop growth, or treatment should be sampled separately. Water and Water-Soluble Fertilizer Analysis: Irrigation water analysis creates a “snapshot” of nutritional conditions and water quality at sampling time. We commonly test greenhouse and nursery irrigation water and water-soluble fertilizer solutions. This tells growers the chemical composition of irrigation water—allowing for the identification of poor water quality and optimization of fertilizer programs.